Fits all Miele Vacuums that use type F, J, or M Dust Bags. AirClean vacuum bags are used with the following Miele vacuums: S4000-S4999, S6000-S6999, S700-S768S, S500-S578, S300i-S399, S290-S291, S241-S256i. Kit includes 4 boxes (packages) of 4 bags. That's 16 individual bags. 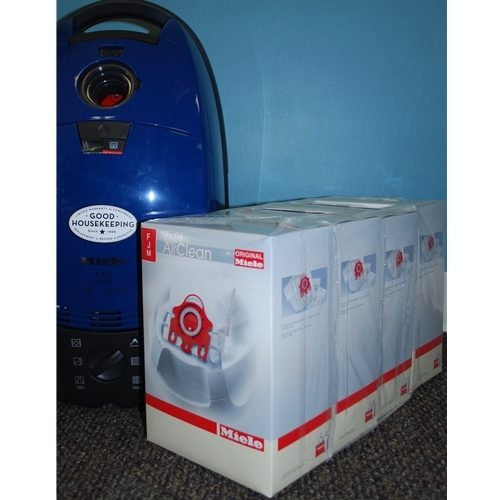 Each package includes 4 Air Clean bags, one motor filter, and one super air clean filter. That is 16 bags, 4 motor filters and 4 super air clean filters. Impact foil preventing sharp-edged objects, such as pine needles, glass and sand from penetrating the bag. Automatic dustbag closure for hygienic removal and disposal.